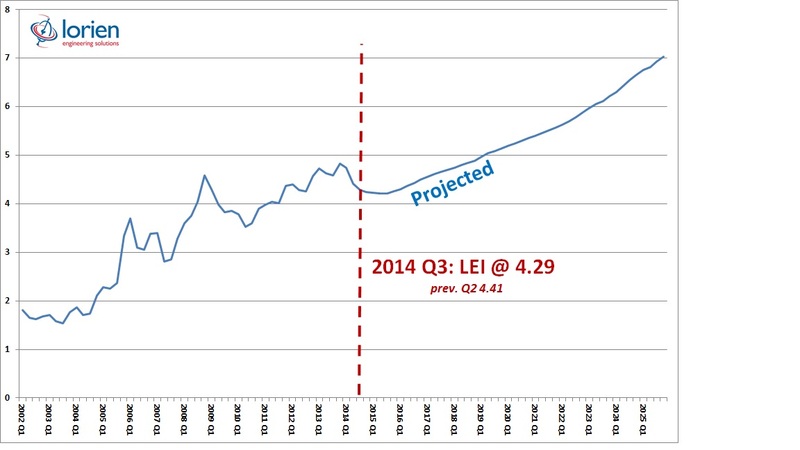 Energy prices fell by a further 3% between the second and third quarters of 2014, 11% lower than for the same period the previous year, latest data from the Lorien Energy Index (LEI) has revealed. Meanwhile, wholesale gas prices have fallen by around 20% since the end of November. Against this backdrop of falling fossil fuel prices, Lorien Engineering Solutions, which produces the Energy Index, is cautioning business against losing sight of progress made on energy efficiency campaigns and self-producing projects. The Lorien Energy Index, which is produced by Lorien Engineering Solutions, monitors the overall cost of energy for business users. It enables companies of all sizes to make sense of their current energy consumption and look at ways they can make savings in the future, by being energy efficient and utilising low carbon and renewable technologies to boost energy security. Lorien’s sustainability consultant Tom Jordan said: “In the UK particularly, lower energy prices are expected to have a positive effect on GDP during 2015, offering stimulus to manufacturers and consumers as prices pressures ease. Last quarter (October 2014) Brent crude fell to $85 a barrel. 2015 has seen this slide continue, with prices dropping below $50 a barrel, which hasn’t been seen since 2009. Gas prices are also expected to show reductions in coming months as the glut in the UK market continues. Lorien is advising that now is the time to justify an investment in renewable energy provision, particularly with the first reporting deadline for the Energy Saving Opportunity Scheme (ESOS) on the horizon at the end of this year.